Dimensions: 36" x 18" x 18"
Shipping & Delivery : Usually ships within 1-2 days. Ground delivery within 3-6 days. 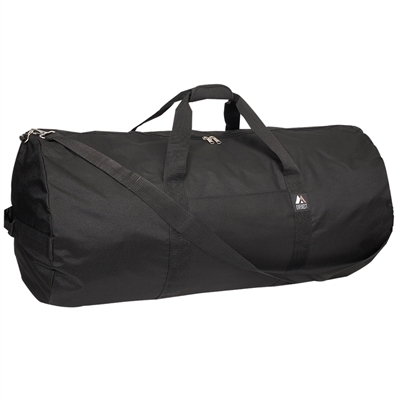 Basic round duffel bag in a 36-inch size, Zippered main compartment. Adjustable shoulder strap. Front flat pocket. Padded hook & loop fastener grab handle, Dual side grab handle for easy transport. Any Size Orders for All Customers - Single Case to Multiple Truckloads. Large Quantities In Stock - Ships from United States - Fast Delivery to All 50 States.